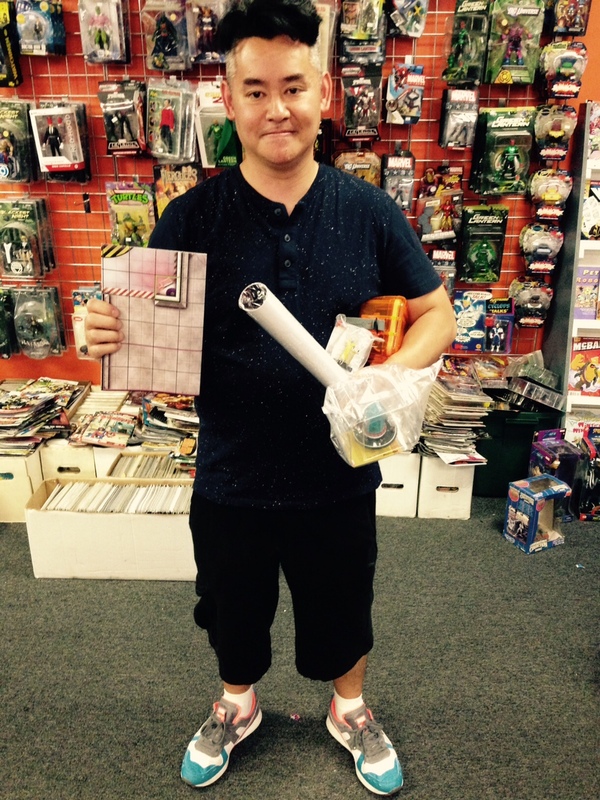 Comics & More Local Tournament Report for 06/10/2015: Age of Ultron SLOP: Month One: Electric Bugaloo!! Did you here that? Age of Ultron hit southeastern Michigan hard last Wednesday (June 10th), and we’ve got the full report! 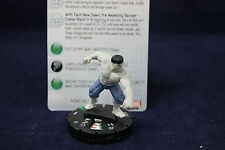 Wave One of the new Marvel Heroclix Storyline Organized Play set has released, and I was privileged to run Month One at Comics & More in Madison Heights, Michigan. In all, we had 10* competitors hit the tables to compete for the Month One Grandmaster LE! For the most part, we followed the WizKids Instruction Sheet and played 300 Point Builds while allowing players to use the Hank Pym Avengers ID card as well (by paying its Point cost) if they had bought the Classic Avengers Fast Forces pack. We also decided to allow the use of the Pym Particles Light Object from the Avengers Assemble LE kit (again, by paying its Point cost), as we deemed it as a group to be thematically appropriate. 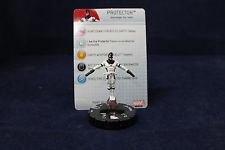 –In our Age of Ultron SLOP Preview, I mentioned that my biggest personal wants from this first Wave were Black Panther (Super Rare), Jocasta (Rare with the “Entity Possession” Trait) and the Protector ID card. Well, someone upstairs loves me, because in my two packs, I pulled… Black Panther, Jocasta and the Protector ID card. I can’t make this stuff up. –The “Thebes, Egypt” side of the Wave One Map (remember, there is no Month Two Map, so all Month Two games will still be played on Month One Maps) seemed almost tailored to the powers of Black Panther. There were multiple tracts of Blocking Terrain to activate his Trait (CLOAKING TECH: Black Panther can use Stealth and Toughness. When it isn’t your turn, lines of fire to him are blocked if he is adjacent to blocking terrain.) and Special Attack Power (SPRING FROM THE SHADOWS: Black Panther can use Charge. When Black Panther occupies hindering terrain or is adjacent to blocking terrain, he can use Sidestep.). Black Panther already has an awesome Dial and Power Set; the possibility of playing on the “Thebes, Egypt” Map really elevates Black Panther into a must-play if you pull him. 5. 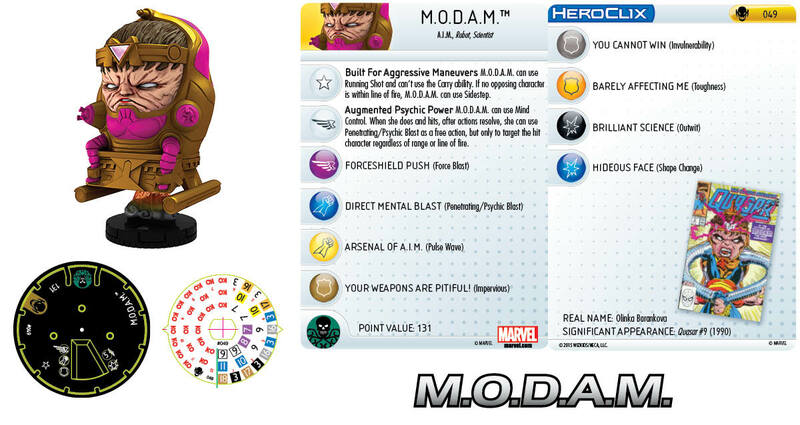 AOU023 She-Hulk (Uncommon): While I was more concerned in our Preview about how she’d interact with AVAS044 Arcade in Constructed formats, I have to say that her full dial Damage Output Potential is frightening. Her top dial Attack Value is middling (it’s a 10), but there are enough supporting pieces with Perplex or Prob in this set to boost that. If you can grab a heavy object on your way, there’s not many figures in this set that She-Hulk can’t one-shot with that opening Charge/Flurry click. In fact, I personally went 2-1, and the one game I lost was to a She-Hulk team that wrecked my Black Panther with a Heavy item hit. 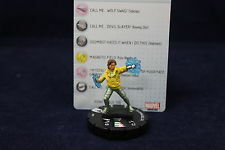 If I saw She-Hulk in my Uncommon slot and didn’t pull any of the next 4 pieces, I would revolve my team around Jennifer Walters. 4. AOU033 Hercules (Rare): Like She-Hulk on steroids. He can Charge and Flurry THROUGH Blocking Terrain, which almost makes him a silver bullet for Black Panther, except for his one glaring weakness: Outwit can just RUIN him, and there’s a significant amount of it in the set–including on Black Panther’s first click. 3. AOU045 Black Panther (Super Rare): I talked at length about him already; he gives you both trickeration, solid (if not spectacular) stats and an excellent amount of avoidance (through his improved Stealth Trait and down dial Super Senses). 2. 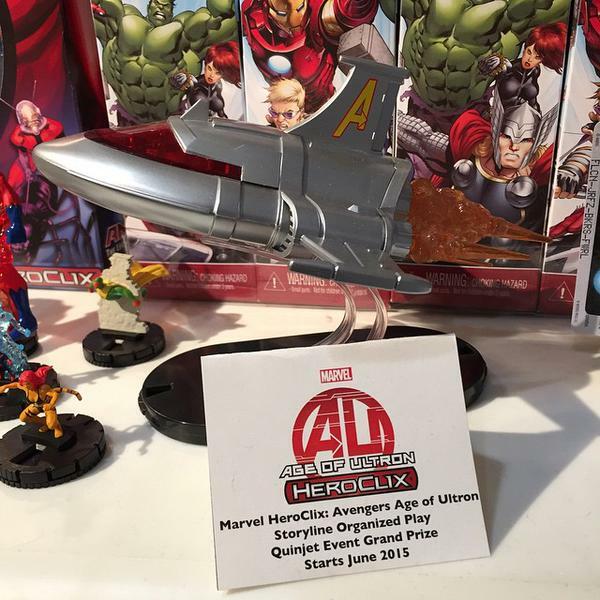 AOU047 Quasar (Super Rare): This set has so little range it’s almost ridiculous. That’s why you can revolve your team around a close combatant and do quite well in a Wave One event. But Quasar is the Outlier. He gives you everything you could ask for in a Primary Attacker for a Constructed Build–in a limited environment like this, he and his 9 Range is virtually unstoppable. We had competitors pull both Chases; the player who pulled Ultron from his time as leader of the Phalanx decided playing his 300 Point dial would be a little too cheesy and elected instead to play his Drone dial (he went 1-2, so he still found some success). I can’t say I would have been as charitable if I had pulled him! Phalanx Ultron just would not work as a one-man army in Constructed. It would just be to easy to out-action him and chew through his dial, even with the back-to-back Stop Clicks. — Ultron-7 (the other Chase) and Goliath (Super Rare) would probably be the sixth and seventh figures on this list in terms of best pieces to build around. So counting them, of the seven best Primary Attackers in the entire Wave, 1 is an Uncommon, 1 is a Rare, 3 are Super Rares and 2 are Chases. All of which is to say, it’s entirely possible that you won’t get one of the “Power 7” figures in your two boosters, which will make for some pretty tough sledding. –The whole Main Dial/Drone Dial thing with the Ultron pieces (including the Chases) seems like an interesting idea that never reached it’s full potential in the design stage. 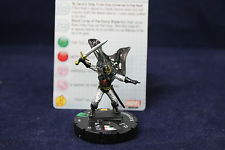 Now, we still have a bunch of Ultron dials to come (including two more Chases, I’m assuming, even though I’d prefer an alternate timeline Morgan Le Fay! ), so that may make the Drones more viable in Constructed. But in Sealed, it’s still tough to do much with them unless your lucky enough to pull two. After a pitched battle of unbeatens, Darren piloted his Jocasta on Victor Mancha/Protector/Wasp Build to victory against Matt’s She-Hulk/Black Knight/Ant-Man squad to take not just the Grandmaster First Prize, but also the points lead in the Quest for the Quinjet!! 3 Points for Winning the Event!! If there is a need to break ties, I will use total Victory Points accumulated during matches. If that somehow ends in a tie, I will use Fellowship votes. If things are still tied, we’ll have a roll-off after I write 4000 words for this site about the improbability of ties in Storyline OP Events. Okay! So that’s where things stand after Month One! And if you expect to find yourself somewhere near southeastern Michigan next month and want to join in on the action (even if you didn’t play Month One, if you join us for Month Two and win, you’ll be right in the thick of things!! 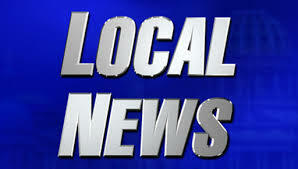 ), Month Two is currently scheduled to go down at 6:15pm on July 8th, right back at Comics & More in Madison Heights!! Hope to see you there! And keep an eye on this space to read about the results next month! Today we’re gonna take a look at the figure rundown for the first Wave of Age of Ultron, which will be coming to a venue near you in the next few weeks!! We’ll be looking at them mostly in the context of Sealed play, since that’s how most of you will be introduced to them, but we will offer our take on how we think a few key pieces will impact Modern Age as well. Now that we’re this close to the event, folks have already started opening booster Bricks prematurely (and probably in violation of their vendor agreement) to sell singles on eBay and on other platforms. Nope. Not these guys. They had permission to open their Brick, and produced a mighty fine Preview for us all. 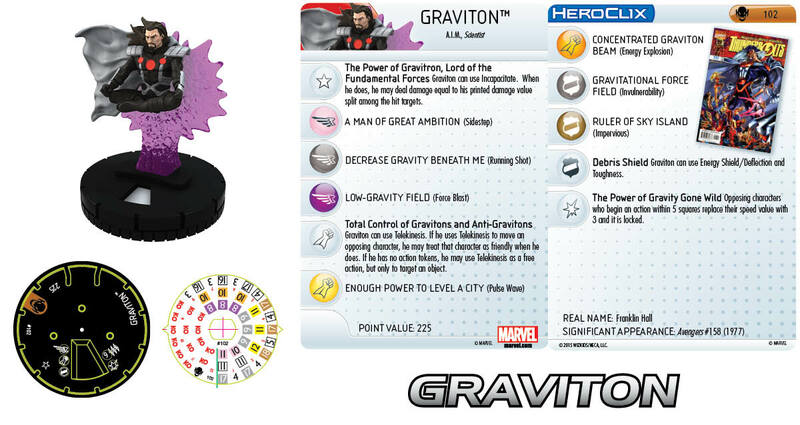 Additionally, WizKids themselves have released some previews, so we now know most of the figures in Wave 1. If you want to go into Month 1 blind and unspoiled, turn away now! Otherwise, sail on!! 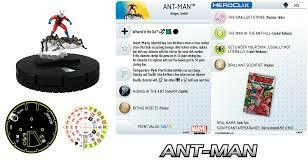 AAOU003 Ant-Man — 100/50 Points — Common: Once again, a dial that’s already been spoiled. There will be more Hank Pym’s to come, by the way, for anyone who is, y’know, completely obsessed with Hank Pym. 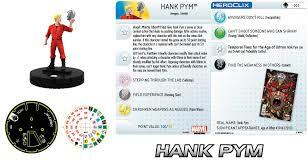 And whose Hank Pym love was not satiated by the Hank Pym Boxed set, which featured, like, six more Hank Pyms. AAOU005 Wasp — 70 Points — Common: So this is actually Janet, not Hank Pym. She does sport the ever popular Lady Liberators keyword to go with her expected Avengers and Celebrity keywords. No Traits, she obviously is a Flyer, and she of course has the “Tiny” Symbol. She starts with (not pictured) an 8 Movement (with Running Shot), 10 Attack Value (with Incapoopitate), 17 native Defense (with Super Senses) and 2 Damage with a Special Power (Founding Member: Wasp can use Shape Change. When she does, she may increase the result by 1 for each adjacent friendly character with a shared keyword (a roll of 1 still fails).). Like her, don’t love her. Super Senses and Improved Shape Change are normally a great combo, but with so much Precision Strike running around in this Wave, often times it’ll just be the Shape Change. She’s probably most useful as a tie-up piece with Incapacitate, but if you send her away from her teammates to tie-up other pieces, she’ll basically just have regular Shape Change and a very hittable 17 Defense. In Constructed, I can see some uses for her, but I’d stay away in AOU Sealed unless she was the only fig that fit the point structure of my Build. AAOU007 Yellowjacket — 85 Points — Common: This looks like the Rita DeMara version. She comes with two really good Traits. The first (Criminal Past, Reluctant Avenger, and Future Guardian: Yellowjacket can use Shape Change and is a Wild Card.) gives her some defensive options; the second (Stolen Pym Particle Technology: At the beginning of your turn, you may choose “Normal Size” or “Tiny Size.” Yellowjacket possesses the chosen combat symbol until you choose again.) lets her float between two different sizes, so she can be Carried out initially (if she’s Tiny Sized) and then spring back to Normal Size if you need to, say, block line of fire or something. Her top dial features an 11 Movement (with Sidestep), 10 Attack (with Precision Strike), 17 Defense (with Super Senses) and 2 Damage (with Perplex!). She has a 6 Range. Plus, she’s got a truckload of great keywords, including Avengers, Masters of Evil, Guardians of the Galaxy and Scientist, one of the best generic keywords right now. I expect to see her played a lot in AOU Sealed, especially since she’s a Common that features top dial Perplex (Perp and Outwit are gold in Sealed). She may also see a lot of house play at your local venue, too, since she fits on so many different teams. So far, Yellowjacket is the early contender for this year’s “White Ranger Iron Fist Memorial Commendation” award, which is given annually to the best Storyline Organized Play Common Figure. Suuuuure you are, Danny. Sure you are. AAOU009 Alexis — 65 Points — Common: Another character I wasn’t too familiar with, Alexis is actually a newer creation that came out of the pages of AvengersAI. If ol’ Rita doesn’t win this year’s White Ranger, then Alexis almost surely will. For 65 Points, you get an Avenger (and Robot-) keyworded figure who is a Flyer (read: Taxi), starts with 9 Movement (with Phasing), 10 Attack (and she’s another piece with Precision Strike–Heaven help you if you just have Super Senses, like most of the other Commons in this set), 17 Defense with Energy Shield/Deflection and a native 3 Damage with Probability Control (uh, what I just said about Perp and Outwit in Sealed? That goes double for Prob Control)!! Now, she has no Traits, no Improved Targeting of any kind, no Willpower/Indomitable and only a 4 Range. But securing a Taxi that also offers Prob and is a more-than-capable Tertiary Attacker for only 65 Points? You are going to be seeing a lot of her in AOU Sealed. AAOU011 Monica Chang — 65 Points — Common: Another AvengersA.I. character. I actually think she debuted in the Ultimate universe first, but I could be wrong. Regardless, she was an important UnClix’d S.H.I.E.L.D. character that WizKids has finally made for us. No Traits, No Improved Targeting. Her Range is 6 with 1 Bolt. She does have the S.H.I.E.L.D. and Scientist keywords, along with the S.H.I.E.L.D. TA, and she starts with Stealth and the odd combination of Penetrating/Psychic Blast and Combat Reflexes. I like the Stealth/Combat Reflexes combo, but Pen/Psy won’t help her when she’s based. Where she really earns her keep is with her Damage Special Power (SHIELD Division Chief: Counter Cyber-Terrorism: Monica Chang can use Enhancement and Perplex. When she uses Perplex, she may modify a combat value by -2 instead if the target has the Armor or Robot keyword.). In Constructed, there are better options. In Sealed, wow!! She can shut down a LOT of pieces in this set. I personally like Alexis a little bit better for the points, but Monica will be EXTREMELY useful in AOU Sealed. AAOU013 Victor Mancha — 100 Points — Common: A somewhat odd piece in the context of the whole set. Victor has Avengers, Robot and Runaways keywords, and he’s a Flyer with top dial Sidestep. He also has Indomitable and an 11 Attack with TK, which are all things that the other Commons in this set mostly lack. He can also do 3 Damage, which is never a bad thing. But at 100 Points, there are better attackers and cheaper Taxi’s in this Wave. Down dial, he becomes both a better supporting piece with a Special Defense Power (Magnetic Bubble: Victor Mancha can use Barrier, ESD, and Toughness. Friendly characters adjacent to Victor Mancha when he uses Barrier can use Sidestep this turn.) and a better attacker, since he picks up a Running Shot/Pulse Wave combination. He’s solid for his points, but I think there are better options in this set. AAOU015 Ultron Drone — 50 Points — Common: Not much to say here. He’s your basic Swarm-bot that gets (slightly) better the closer it is to other characters with “Ultron” in their name. 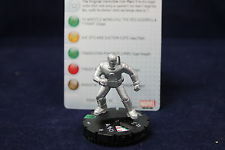 AAOU017 Iron Man — 90 Points — Uncommon: This Iron Man comes with a lightning rod Trait (The Original Invincible Iron Man! : If the first ranged combat attack made during an opponent’s turn doesn’t target Iron Man, modify the attacker’s attack and damage values by -1.) that makes him somewhat compelling. Just keeping him in the back while you press the rest of your forces forward almost makes him worth his points for that alone. He does also offer Charge, Super Strength and Outwit, so he’s an average secondary attacker as well. AAOU019 Hulk — 80 Points — Uncommon: Basically the close combat version of the Iron Man above, Hulk even comes with a very similar Trait (The Original Incredible Hulk: If the first close combat attack made during an opponent’s turn doesn’t target Hulk, modify the attacker’s attack and damage values by -1.). His combat values are outstanding for his cost (he even does 4 Damage top dial), but he’s extremely schizophrenic, due to his other Trait (With Each New Dawn, the Weakling Banner Comes Back: At the beginning of your turn, roll a d6 that can’t be rerolled. On a result of 1-2, until your next turn modify Hulk’s combat values by -2 can he can use Outwit, Perplex, and Shape Change and can’t use any other power he possesses. This ability can’t be ignored.). So basically, you have either a phenomenally good Secondary Attacker (relative to what it costs to field him) or a PRETTY good supporting piece. The problem is, you may not know which figure you have until it’s too late. AAOU021 Black Knight — 115 Points — Uncommon: Charge and Exploit Weakness are always good, and he starts with an 11 Attack Value. The problem is that he immediately loses that 11 Attack by click 2, he has no Willpower unless he’s already KO’d a character, and one of his Traits (By Sersi’s Side, From One Universe to the Next: If Black Knight is adjacent to a friendly character named Sersi, both characters modify their defense values by +1 unless already modified by this effect.) 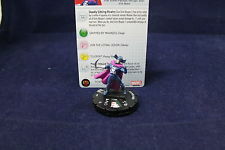 is completely useless in this set (since the only Modern Sersi we have is in Avengers Assemble. Theoretically, it is possible that your venue might give you one AOU Wave 1 Booster and one AA booster, and that you MIGHT pull both of those characters, but even then they may not be worth playing together). He has Traited B/C/F and Steal Energy, which will help offset the fact that he doesn’t have Willpower, but it just seems like there are much better ways to spend 115 Points in this set. 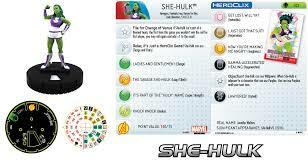 AAOU023 She-Hulk — 130/75 Points — Uncommon: Another figure that’s already been previewed on Heroclix.com. I love her Trait (File for Change of Venue: If She-Hulk isn’t part of a themed team, the first time this game you wouldn’t win the roll for first player, you may roll again and add +1 to the result. ), especially when used on an Arcade team. It’s not clear if you would get the +1 modifier on the second roll for Map Choice, but just the ability to try for Arcade’s map a second time if you lose the first roll is huge. AAOU025 Machine Man — 120 Points — Uncommon: More of a novelty attacker than anything else, Machine Man is a close combatant without Charge or a very high Damage Value. His Trait (Extendable Body Parts: When Machine Man makes a close combat attack, squares within a range of 3 and line of fire are considered adjacent.) somewhat mitigates the first problem, and Super Strength will help with the second. 120 Points seems about right for what he does, and he has some versatility to him, but if he’s your Secondary Attacker, you Damage Output Potential is probably low. AAOU027 TESS-One — 150 Points — Uncommon: Once again, we have a close combat figure with a significant cost that doesn’t have Charge. Sidestep is better than nothing, but it ain’t Charge. The ability to move through (and destroy) Blocking Terrain is a big plus, but again we have another figure that’s saddled with yet another narrowly useful Trait (Total Elimination of Super-Soldiers: As long as an opposing character on the map is 100 or more points and named Captain America, TESS-One can use Willpower. When attacking such a character, TESS-One’s damage value is modified by +1.) that will NEVER help you in AOU Sealed. Why? Because, SPOILER ALERT: There is no Captain America in Wave 1. Frankly, you’re paying for a lot of powers abilities in this dial that you’ll probably never get a chance to effectively use. RCE? Great! Only a 5 Range? Less great (although Sidestep actually will help here…). The one real positive with TESS-One is that it is really hard to kill. It’s Defense actually gets better (a LOT better) down dial, and it picks up a Movement Special (Rebuilding From The Rubble: At the beginning of your turn, if TESS-One occupies a square containing a debris marker, heal TESS-One of 1 damage.) that gives it a way to (somewhat) reliably heal a click every turn. 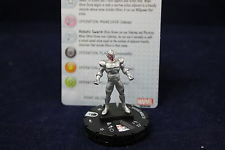 AAOU029 Ultron-8 — 120/30 Points — Uncommon: And now we have our first real Ultron. Get used to seeing his Trait (Autonomous or Drone Mode: Ultron-8 costs 120 points, or costs 30 points and begins on the click #1 after the orange KO. Until KO’d, Ultron-8 is considered 120 points. ), cuz most of the Ultrons have some form of it. The idea is to play multiple versions of a single Ultron, and your opponent will really have no way of knowing which one is which, because their dials will be exact replicas of each other… except that the Drones only have 2 clicks of life. As for the dial itself, it’s pretty solid. 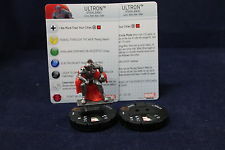 I’d rather play this Ultron at 120 Points than Machine Man, that’s for sure. AAOU031 Vision — 100 Points — Rare: This is the semi-evil, fresh on the scene, son-of-Ultron version of Vision, and he’s exactly as he should be! 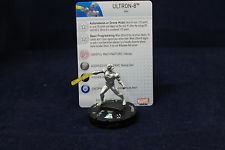 If you pull him in Sealed, just pray that you also pull an Ultron–ANY Ultron! 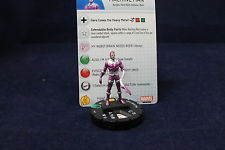 His Trait (Secret Programming: When a friendly character whose name includes Ultron is given a move action and actions resolve, Vision may be given a move action as a free action.) pretty much completely makes up for the fact that he only starts with Sidestep, and his Movement Special Power (He’s Coming… Through the Wall! : Vision can use Sidestep. When Vision uses Sidestep or is given a move action, he can use Improved Movement:Ignores Blocking Terrain.) works quite gracefully with his Trait. He also adds Indomitable, Super Senses and Shape Change to go with his Penetrating/Psychic Blast. His 10 Attack is pretty pedestrian, but in this set that’s really par for the course. This is a much better Vision than his Age of Ultron Movie cousin, even though they cost the same amount of points. AAOU033 Hercules — 220/130 Points — Rare: The first real solid close combat brick of the set, with improved Charge, Traited Super Strength, Impervious or Invincible for much of his dial and a lot of CCE and Battle Fury (which will help with the surprising amount of Shape Change in this set). If you pull him, you’re probably playing him. I like his 220 Dial in a 400 Point event, but I LOVE his 130 Point dial in just about any format. Yes, he’s a little top heavy at 130, but man, he is going to be scary to face. He also gives us a Modern Age Herc to bring in with his Avengers ID card, which is great as well. Definitely a needed figure. AAOU035 Protector — 100 Points — Rare: There are two big things to remember about Protector. The first is that he’s one of the few (gosh, there’s like, I dunno, 3 or 4) characters to appear in the same Set/Wave as his Avengers ID Card. So, theoretically, you COULD pull both Protector AND his ID card. Secondly, when it comes to calling for his help via an ID card… that’s probably the best way to play him! On his own, there’s nothing very special about him. He has Sidestep, he flies, he has a 10 Attack with NO Attack powers and he does a ho-hum 3 Damage. He does offer Probability Control and an 18 Defense Value (with Defend), which is nice, but hardly game breaking. If you could get all that for just one important turn, however, and you only had to spend 5 Points to do it… well, Protector just became very exciting, didn’t he? All of a sudden, you’re opponent has to hit an 18 Defense to hit anybody, and he probably has to do it at least twice, since Protector has that Prob at his disposal. In Constructed, he offers another alternative for Avengers and Kree teams, but honestly, he’s one of the best ID Card Call-Ins, so that’s how I’d expect to see him used most often. AAOU037 Grim Reaper — 119 Points — Rare: Wow. Another Trait (Deadly Sibling Rivalry: Give Grim Reaper a free action when he is within 4 squares of a character named Wonder Man and modify all of Grim Reaper’s combat values except damage by +1 until your next turn. When you do, deal Grim Reaper 1 unavoidable damage at the end of this turn.) that gives its owner NOTHING in Sealed. I’m betting we’ll probably see a Wonder Man in Wave 2, which will mean nothing to you if you happen to pull Grim Reaper here in one of your packs. He’s basically a 119 Point gamble. While he has a tiny amount of Range (4 squares), if you play him, you’re planning on Charging folks and hitting them with his special Energy Stealing B/C/F, since his native Damage never climbs above 2. If he were, say, 79 Points, he might at least be interesting. At 119 Points, he just doesn’t do enough to effect the game (even the Prob Control they gave him doesn’t show up until his last two clicks). We needed a new Grim Reaper, but this is the one Rare/Super Rare/Chase that I’m hoping I never see in a box that I’m opening for Sealed. 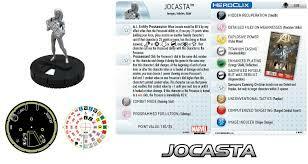 AAOU039 Jocasta — 130/25 Points — Rare: Jocasta was already previewed by WizKids, so there isn’t a lot more to say. Since she can work like an Entity, she’s definitely one of the “buzziest” pieces in the set, but her real talents will shine through more in Constructed that they will in Sealed. Very solid piece, and a nice tweak of the Entity Possession Trait. This is one of my personal “big wants” from the set. 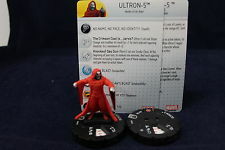 AAOU041 A & B Ultron-5 — 120/60/30 Points — Rare: AAOU41A is basically a (slightly overcosted) Leadership engine for Masters of Evil teams, while the B-side is very much a swarm dial that operates as a Switch Clix with the same Autonomous or Drone Mode Trait that all the Ultrons have in this set. 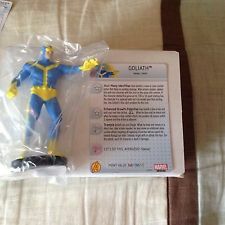 AAOU043 Goliath — 140/100/50 Points — Super Rare: A SR Hank Pym. Yay? Well, you might be cheering after you see his dial. For 140 Points, he actually has one of the the best Close Combat dials in the set. The Morph power is nice, but in most cases, your better off just sticking with Goliath. His top dial Movement Special is amazing (Trample: Goliath can use Charge. When he does and moves in a direct line, after actions resolve, he may make an additional close combat attack targeting all opposing characters whose square he moved through but didn’t already target with an attack this turn. For this attack, each hit character is dealt 3 damage. ), but he only keeps it for one click. He does pick it back up on clicks 3 and 4, though, and with top dial Invincible, it’ll be tough for someone to knock him all the way past those “money” clicks (God, especially in this set). Goliath brings a lot to the table AND leaves you a bunch of room for supporting figs. If your lucky enough to pull him in Sealed, he’s a definite play. AAOU045 Black Panther — 140 Points — Super Rare: Wow. The hits keep coming with the Super Rares! This is pretty much the quintessential version of Black Panther. 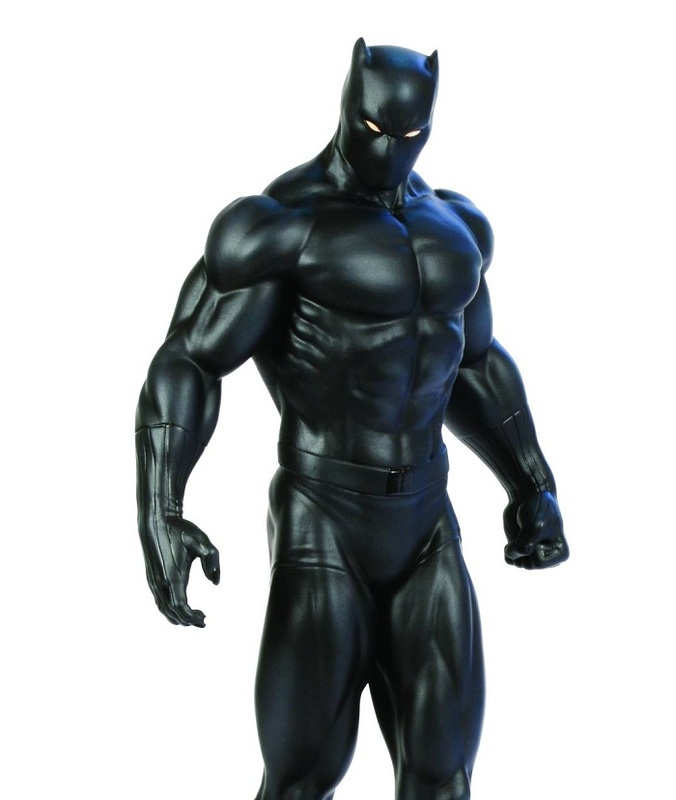 He was Previewed by WizKids already, but I’m going to go through his dial anyway because I really love this T’Challa. First of all, his keyword line is jammed pack with everything from great names like Avengers and Illuminati to the best generics like Mystical and Scientist. He ignores Elevated and Hindering Terrain on movement, so his mobility is awesome, and he’s also going to be extremely difficult to find at range due to his fantastic Trait (Cloaking Tech: Black Panther can use Stealth and Toughness. When it isn’t your turn, lines of fire to him are blocked if he is adjacent to Blocking Terrain.). Pay very close attention to that wording–it’s very similar to the wording on IIM038 Iron Man‘s Personal Cloaking Device Trait. WizKids already ruled that Iron Man’s Trait gets around Pulse Wave, and I’d imagine they’ll rule that T’Challa’s works the same way. All of which means that if you can keep T’Challa adjacent to Blocking Terrain (maybe with a supporting character who sports Barrier? ), he’s pretty much invulnerable to any sort of ranged attack. His Movement Special Power (Spring from the Shadows: Black Panther can use Charge. 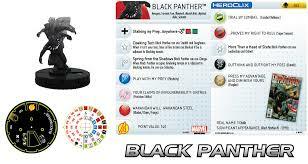 When Black Panther occupies Hindering Terrain or is adjacent to Blocking Terrain, he can use Sidestep.) goes hand in hand with his Trait, and his Damage Special adds Leadership and Outwit. On top of all that… he probably has the best sculpt in the set. Another of my biggest wants from the set. He’s an absolute monster in Sealed, especially with the right supporting pieces behind him (or, really, the right map), and I think he even has potential in the Meta (maybe not a lot, but still) simply based on that ridiculously good Trait. You can’t KO what you can’t see. 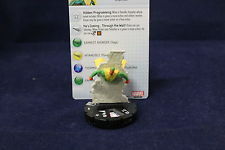 AAOU047 Quasar — 225/125 Points — Super Rare: Wow! Now this is a ranged Primary Attacker! His dial almost feels like something out of Justice League: Trinity War or Guardians of the Galaxy rather than this current cycle of Avengers Assemble and Age of Ultron. He has two dial options, and they’re both terrific. At 225 Points, he is going to be a heavy hitter that can fling 5 natural, penetrating damage up to 9 squares away. In this set, that might as well be 100 damage. He’s going to one-shot some opposing support characters, and it’s going to be tough to retaliate effectively over that distance. Plus, his first three (of NINE!!) clicks feature Invincible, so even if your opponent retaliates heavy, it’s going to be tough to make any headway. 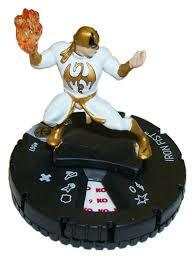 Especially since Quasar has the Power Cosmic TA, so you can’t counter his defenses. His 125 Point dial is great as well, but for different reasons. His Defense actually gets BETTER against ranged attacks, and he picks up a Damage Special that partially imprisons anyone he hits (Contain Standard Operating Procedure: When Quasar targets and damages a single opposing character, after action resolve, he can use Barrier as a free action, but may only place blocking terrain markers adjacent to the hit character.). On top of all that, if your opponent does hit him, Quasar goes right into an Attack Special Power that allows him to Steal Energy even with ranged attacks! Basically, the only piece Quasar really needs to fear in this Wave is probably Black Panther, only because T’Challa is impossible to hit from range. 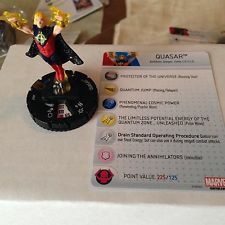 If you pull Quasar and don’t play him, you’re either an idiot or you’re trying to impress someone for some reason, even though you’ll really just come off as an annoying D-bag. Don’t be either of those guys. They’re A-holes. 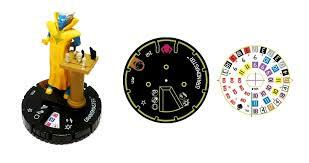 Play Quasar if you get him. This is what you look like if you pull Quasar and don’t play him. AAOU049 M.O.D.A.M. — 131 Points — Super Rare: The latest Preview from WizKids. She’s a fun character, but she’s also limited in what she wants to do by her 5 Range. AAOU051 A & B Ultron-1 — 120/60/30 Points — Super Rare: Okay, so if Black Panther has the best sculpt, this is probably a close second. 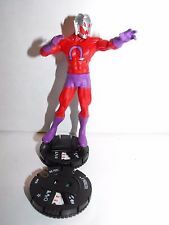 The A-dial is a nifty little trickster who comes packing a couple of cool Traits, including one that really narrows your opponent’s options if you hit (Total Mind Wipe: Once per game, when Ultron-1 hits an opposing character, you may give that character a Mind-Wipe token. A character with a Mind-Wipe token can’t attack Ultron-1 unless that character and Ultron-1 are the only characters on the map.). 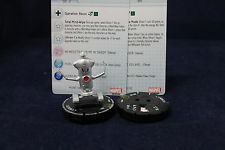 His down dial Defense Special (Self-Upgrade: Ultron-1 can use Impervious and Regeneration. When he uses Regeneration and the result is 5 or 6, place an Upgrade token on this card.) offers the chance to gain Upgrade tokens, each of which gives him +1 to all combat values. He’s not the bruiser that some of the other pieces in this set are, but the longer he’s left alone, the deadlier he gets. The B-Dial offers the normal Autonomous or Drone options and adds a fantastic Defense Special (The True Creator of Me is… Myself: When a friendly character with the Autonomous or Drone Mode trait is KO’d, you may roll a d6 that can’t be rerolled. On a result of 4-6, place that character in your starting zone on its click #1 after the orange KO.) that can keep the Ultron assembly line going. AAOU053 A & B Ultron-7 — 150/125/30 Points — Chase: Ultron-7 A is a close combat bruiser who turns into a ranged attacker with a Running Shot/Special Pulse Wave power in the middle of his dial. He has a top dial Damage Special that helps teammates (Hatred of the Horde: Ultron-7 can use Battle Fury and Leadership. Opposing characters that are adjacent to a character friendly to your force can’t use Outwit, Perplex, or Probability Control. ), but otherwise his dial is surprisingly straightforward for a Chase. The B-dial is a surprisingly sturdy (for its points) ranged attacker, but nothing to write home about. Someone is going to find a way to break all these Drones into a great army, but it’s not going to be me. 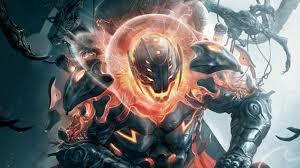 AAOU55 A & B Ultron — 300/120/30 Points — Chase: Here he is–Ultron himself. At 300 Points, you’d expect a lot from his A-dial, and you might end up a bit disappointed. He doesn’t even have a move-and-attack power top dial–just Phasing/Teleport. And his Attack Value never goes above an 11–until you get to his two Stop Clicks (they appear on consecutive clicks). Once you get to his Stop Clicks, Ultron will wreck house–provided there is an opposing character within 5 squares that he can Charge (or 8 Squares if you’d rather Quake fools). 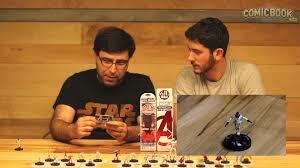 In Sealed, you can probably get away with this–especially in a 400 Point game. In Constructed, he’s so easily outmaneuvered that it’s almost comical. The B-Dial is a glorified Robot Taxi that can moonlight as a Secondary Attacker. So there you have it! Last year’s Storyline OP featured Chases that were so good they were broken and had to be (mildly) nerfed by a Watch List fix. This year, the Chases are confusing and almost a waste of time, in my opinion. The Super Rare slot is definitely where it’s at. 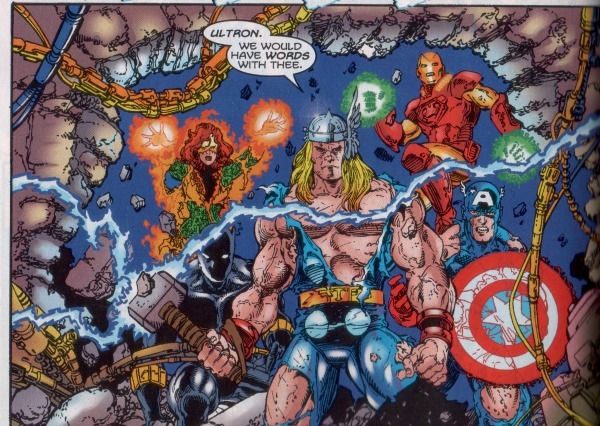 Outside of, say, M.O.D.A.M., there’s not a loser in the bunch (even the Ultron was pretty unique and original). Good luck with your Month One pulls, and we’ll see you back here soon for our traditional dueling Top Ten Set Reviews for Avengers Assemble! Those should start dropping next week! YOU CLONED WHO?!? : Give Arnim Zola a free action to place a Gwen Stacy Clone bystander token as described on this card adjacent to him on the map. If there is already 1 friendly one on the map, this is a power action instead. If there are 2 or more friendly ones, this is a double power action instead. I prefer to think of Gwen Stacy Clones as Fembots. 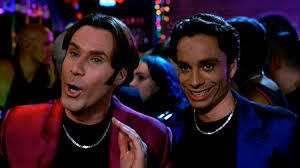 Groovy baby. Yeah! Basically this trait can let him pop out a couple of XP001 Con Artists pretty effortlessly. Except, the Gwen tokens don’t need to be pushed to get to their Perplex and they don’t give the other team points when KOed. Pretty Cool. Unfortunately, the downside is that if you have two on the board, Arnim Zola needs a double power action to make another one. Because he lacks Willpower, a double action token means pushing damage. 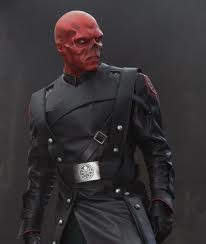 Can you imagine if the AVM016 Red Skull was still in modern? Between their two traits. you could set up a mad science lab in your starting zone. Why is my doomsday device filled with all these young women? That’s a total of 4 Perplexes (two Gwens, two techs), two Enhancements, a Leadership, and Outwit. That’s a lot of support. The Warbots are there to hold off the other team while you are building. Backed up by that much support they can be dangerous. If The Red Skull can finish his doomsday weapon, then the other team is in for some real trouble. Now that team was fun, but Arnim would take pushing damage if he tried to have more than two Gwen tokens on the board at once. 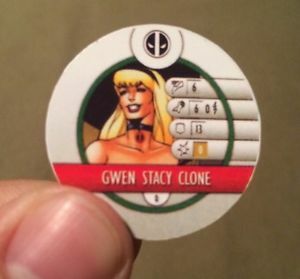 If you could counteract the problem of Arnim taking damage from a double power action, you could flood the board with Gwen Stacy tokens. There would be no theoretical limit. 3? 6? 12? You can keep making them in your starting area until your opponent’s team shows up to make you stop. How many Gwen Stacy Perplexers would it take to give the mugger that murdered Uncle Ben a fighting chance against Spider-Man? 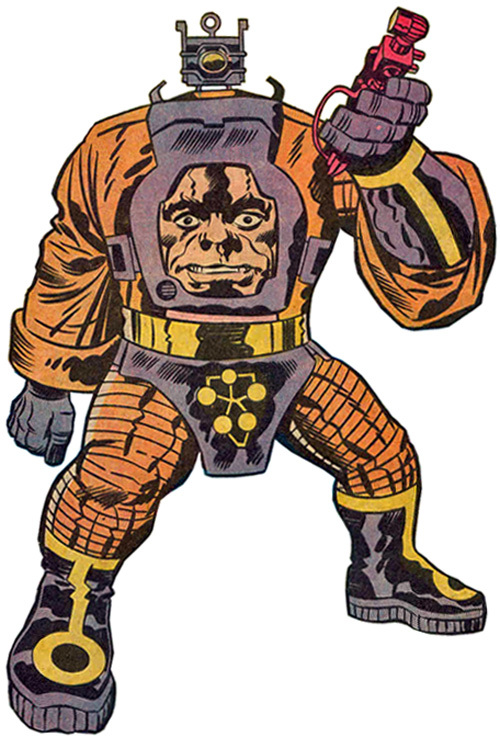 With Arnim Zola you can find out. Gwen Stacy will be the model T of my clone Assembly line! With two Armin Zola’s you can pump out an average of one Gwen a turn. Moira is there to offset pushing damage. Unfortunately when the other team finally does come to find you, your mobility isn’t great and your primary attackers have only on click of running shot and no willpower. If you have a lot of Gwen tokens out, you should have a shot at taking down anyone. Good luck. Green Goblin can carry Arnim Zola around and help you avoid the other team a little longer. The longer you avoid them the more Gwens you have. With enough Perplex Green Goblin makes an awesome primary attacker. Perplex his attack by +3 and there is nothing he can’t hit. Perplex his damage by +3 and there will be not much left of whatever he does hit.